This is a tweaked-to-suit-my-routine version of the barley and flax seed loaf in Tartine No. 3. 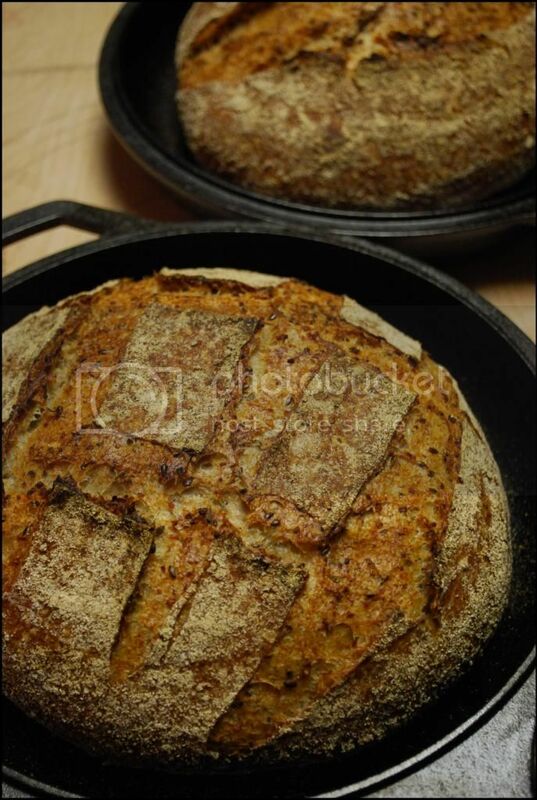 The biggest change was to the leaven – all whole wheat flour, 75% hydration, and more of it. I also switched from barley flakes to cracked barley because that is what I had access to. The rest of the numbers I just put together in whatever way I thought would give me the greatest margin for error. And, this was the inaugural bake in my new cast iron combo cookers. I never thought I would take the leap, but my curiosity finally got the better of me. I must say, I am impressed. The size and shape limitations mean that I will never rely on them entirely, but they do make things simpler (and I don’t have to worry about setting the wet towels on fire!). The method stayed pretty close to the one presented in the book, so I will avoid going through it in detail. One change I did make was to do the turns at shorter intervals, 15-20 minutes, to accommodate the faster fermentation brought on by the increase in leaven. The dough was also drier than I anticipated, so I added a bit of water with each turn. As for the result… I like it! Crust, crumb, flavor: all good. 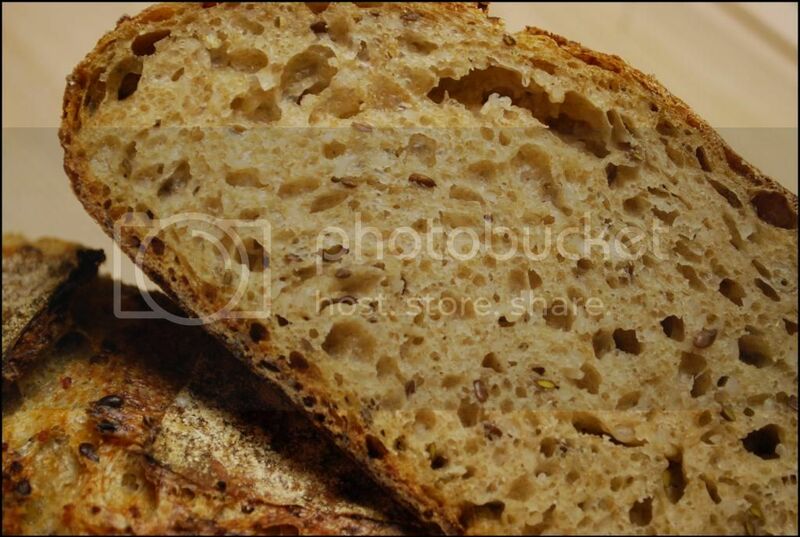 There is a nice nuttiness from the flax seed and the barley smooths out any rough edges from the whole wheat. OK, I need to reduce the salt a bit, but that’s easy enough. This is one of those loaves where I can tell I got the fermentation right and the rest mostly followed from there – I wish I could do that every time! Odds and ends – The formula may look a little wacky because of the porridge. So it goes. I don’t know if there is a convention on how to present this. In the end I treated it as an add-in, otherwise the percentages get so skewed as to make them meaningless. As for the rest, I tried to present the basic info so you could take whatever mathematical leaps tickle your fancy. The one measurement I regret not having taken was the weight of the porridge after cooking. So it goes, again. Oh, and check out the book. It reads a little like the blog section here on TFL. No wonder I’m enjoying it so much! Those look Awesome! I bet they smell and taste great as well. Thanks, WoodenSpoon! They came out very tasty. I'm already looking forward to what it will be like toasted. Might be a while, though. This one feels like it will stay fresh for a while. I'm doing the same thing with some other variations as we speak. 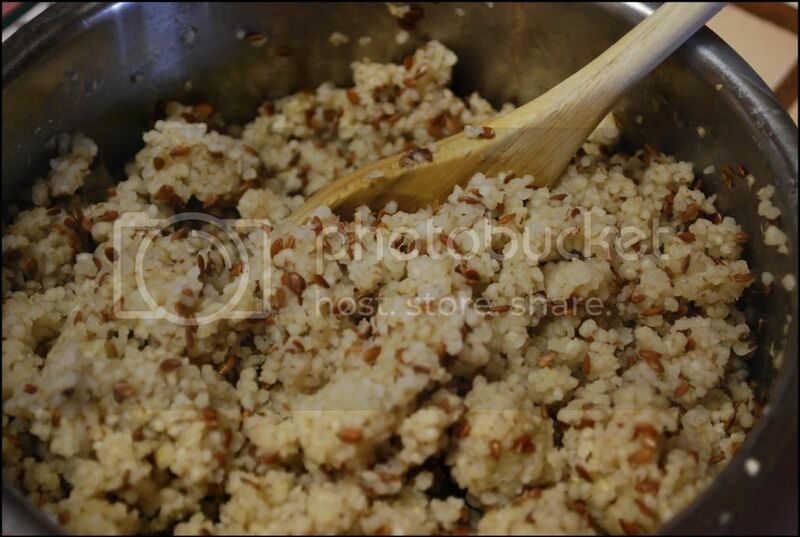 My changes are the porridge (using 25% instead of 50% ) is pearled barley and steel cut oats along with the flax. The porridge got way too thick way too fast and is being a bit of a hassle to incorporate but I think it will by the end of all. I used the written amount of levain but split it with one overnight 12 hour @ 80% hydration and the other half the signature young levain. 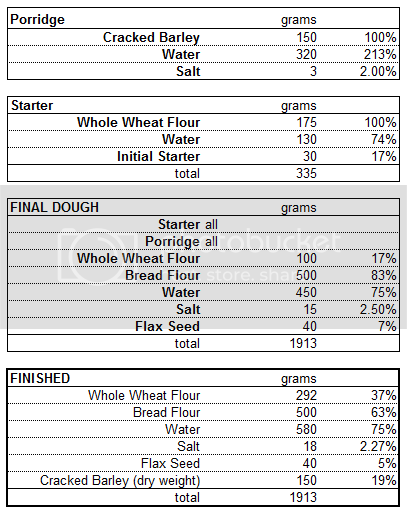 And finally 5% of the flour is Toasted Oats ground into a flour. My dough is also too dry and I've been trying to add some extra h20 through the folds. Will be baked in the AM. Hope mine looks as nice as yours. The book so far has led me to experimentation but I cannot get myself to follow a formula straight out. More fun to venture a bit. I'm with you, Josh. The formulas are mostly simple enough to make great starting points. I've already worked-up a barley and polenta combo I want to try next chance I get. I'm thinking about doing the porridge as more of a hot soaker, not fully cooked, to try and retain more texture. The porridge for this one did take some effort to incorporate, as you noted, from being a bit clumpy. I tried this formula once already, sticking closer to the original. 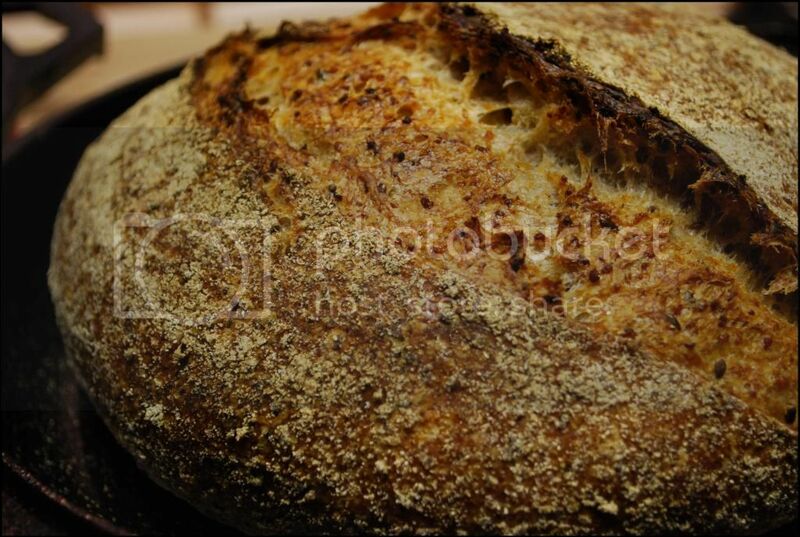 The young leaven (and the small amount of it) threw me off because I'm just not used to it. The dough develops differently and the fermentation really takes its time. Not wanting another so-so loaf I decided to save that learning curve for another time. I like the sound of your variation. I bet it will turn out great. 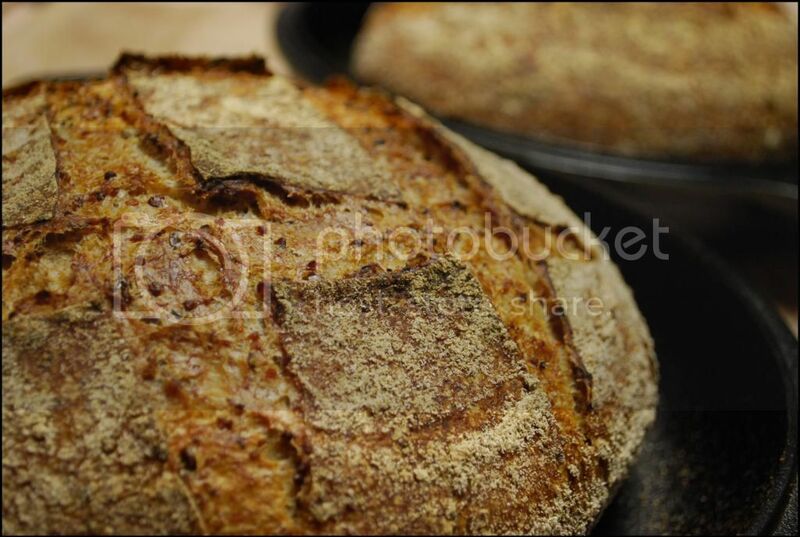 Oh, and I never got a chance to comment on your black rice bread, but it looked amazing! Great idea! Crumb looks perfect and they look so tasty. With the barley and flax seeds they must be very healthy too. Enjoy ! Thanks, ElPanadero! I hope it is healthy, because I can't seem to stop eating it! Lucy loves this bread inside and out. I'm guessing the dark side will be better for Chad than the light side was by a wide margin. Glad to see him produce such a nice bread book and so many baking from it. Well done and happy baking! Thank you, Janet, and thanks for the link - interesting technique. It's a little like adding granola to the bread... another thing I may have to try one day. "How to divide up the water?" does become a thought provoking question with these breads. Between that and deciding which grain(s) to try there is definitely fun to be had! Congrats on the new combo cooker. Wow, this is a handsome bread, Marcus! Great looking loaf Marcus. 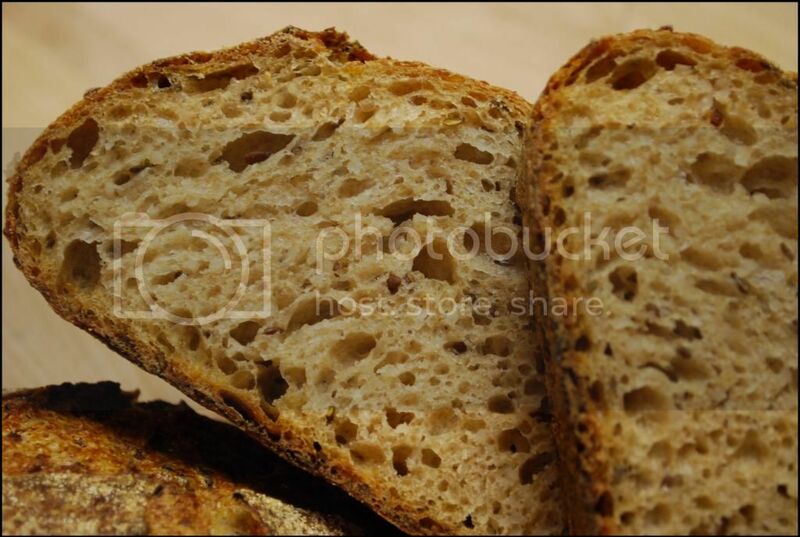 I love the look of the crumb in this one. Thanks for sharing. Another reason for me to buy this book. It's certainly a book worth taking a look at. I like that there are plenty of photos to go with the formulas. Thanks for the kind comment, Ian! Gorgeous looking crust, and the crumb is sublime. Haven't used my Dutch Oven for baking in ages, but after seeing your loaf I'm thinking I better dust if off and get busy with it. I know what you mean about how to present or calculate the total hydration when including a soaker of some kind. Usually I end up dividing the soaker water by 3 or 4 depending on the grain used and use that figure as a component of what I call estimated total hydration. Not completely accurate, I know, but close enough to be in the ballpark I reckon and more a useful guideline than a hard number. Always a pleasure to see your fine baking. Thank you so much, Franko! Thank you so much, Franko! One bake, and I'm already sold on the DO's. I guess this means I'll have to put a little extra effort into my boule shaping skills. I think "estimate" is just the right word for the hydration. I figure the first bake is always going to be more of a "let's see how this goes" affair than it would be with an all flour bread. But the payoff when it works out is well worth the effort!